I’m from the great state of Maine and with it being the holidays, I often reminisce about the holiday season back home. The family, the friends, the laughs, it was great. On Christmas Eve, my large family and I would go over to my aunt’s house for lobster stew and a holiday gift swap. Oftentimes the night ended with all the cousins playing games in the (heated) sunroom watching snow fall outside. It’s memories like those that make me miss family and having a sunroom. Sunrooms may be a larger project than building a pergola or patio, but it is truly an addition to your home that you can use day and night, all months of the year. At Archadeck Outdoor Living, we design and build sunrooms that fit your home and your needs. Sunrooms, like any outdoor living structure, are not a one size or design fits all scenario. There are so many aspects that need to be considered to create the perfect space: the size, shape, light, etc. Some homeowners can be surprised at how much a sunroom can impact their existing home when not properly designed, lighting being one of the main effects. For example, an existing home may get a lot of natural light in the back during the afternoon. If you build a large sunroom off the back, it may impact the amount of light that gets to the main home. Archadeck may suggest adding skylights to the sunroom to ensure the difference isn’t too dramatic to homeowners. 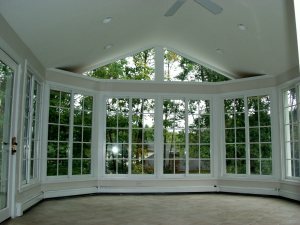 The windows of a sunroom are also a large consideration when designing a sunroom. The style depends on the owners taste and sometimes their location. Some clients prefer a sunroom that has floor to ceiling windows. It provides and unobstructed and open view of the outdoors. It’s stunning, but it may not be perfect for a home in New England if the owner wants to use the space year-round. They would have to spend more in heating than if the windows were smaller. These are just a few of the considerations that come into play while designing a sunroom. If you’re looking at adding one to your home, talk to a local sunroom builder, like Archadeck Outdoor Living, who will walk you through the options and process. Happy Holidays from all of us at Archadeck Outdoor Living! OK, so sometimes we just need to gush, and today is one of those days. Our very own Kyle Faulkner, owner of Archadeck of Raleigh, is featured on the cover of this month’s Veterans in Franchising magazine. Kyle and his wife Paige joined the Archadeck system just over a year ago. Having spent 8 years in the military and based in California away from family on the east coast, Kyle and Paige wanted to be closer to family and settle down and raise one of their own. When looking at different franchise organizations, Kyle wanted something that connected to his experience in the construction world. Both his father and grandfather were carpenters and as he says “I started out doing construction from the time I could swing a hammer.” Source. When we first spoke with the Kyle during the discovery process, we learned that he loved building, but also the outdoors, and Archadeck brought both of those passions together. Since launching their Archadeck business, Kyle and Paige have grown their territory and their family, welcoming a baby girl last spring. They both enjoy the work/life balance Archadeck allows, spending the weekends with friends and family. Kyle is just one of the veterans in the Archadeck system. We’re thankful and proud of all of them! Archadeck Outdoor Living has been in business since 1980, positioning itself as the expert in custom outdoor living spaces. From a simple and functional deck to a robust outdoor living structure with a deck, patio, porch, pergola, outdoor kitchen or some combination there of, Archadeck does it all. Each project is custom designed with our clients’ needs, wants and tastes in mind, ensuring the finished project is just what they wanted. If you have questions on the Archadeck business model and if it could help you achieve your personal and financial goals, please visit us at ArchadeckFranchise.com.